Islam News Room - Jesus IN Quran? Jesus in Quran? Last Days? While Some Talk of Burning Koran (Quran) - Others are taking the time to read it. Guess what? and HE ACCEPTED ISLAM - Became a Muslim.. Please Note: For Muslims, it is not a matter of how we "understand" (or how we don't understand, for that matter) what Quran teaches us. The Quran is most clear in the Arabic language. And it teaches us; Jesus, peace be upon him, was not killed, nor crucified. Keep in mind that unlike the Bible of Christianity, we do possess the original Quran (recitation) in the hearts and minds of over 1 billion people. Over 9 million of us have memorized the entire Quran from cover to cover in the original Arabic language, jot for jot and dot for dot. So we know that we do have the original and only version of the Last Testament. 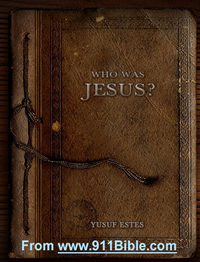 The Quran clearly states that Jesus, peace be upon him, did not die, nor was he ever crucified, nor will he ever be crucified. Read from the Quran, chapter about "Women", An-Nisaa'. By the way, because the Quran still exists and unlike the Bible has only one version, I was able to easily include the original Arabic text for you. This really makes it nice as there can not be even two opinions as to what it says. Did you know that over one billion people have memorized a portion of the Quran? And that over 9 million have memorized it entirely? The real surprise is that over 88% of them are not Arabs. Amazing huh? 4:157 They boasted, "We killed Jesus Christ, son of Mary, Messenger of God." But they did not kill him, nor did they crucify him. Rather, something was made apparent unto them and they have been differing about, full of doubt, with no certain knowledge, but only conjecture to follow, for sure they did not kill him. 4:158 Not at all, Allah raised him up unto Himself; and Allah is Exalted in Power, All-Wise. 4:159 And there are none from the People of the Book, except they must believe in him before his death; and on the Day of Judgment he will be a witness against them. The Almighty God (Allah) of the Quran is not a man that He should sin; nor is Almighty God a son of man that he should repent. [ref: Numbers, 23:19] Now look to the Bible in the Old Testament, Book of Numbers. "God is not a man, that he should lie; neither the son of man, that he should repent: hath he said, and shall he not do it? or hath he spoken, and shall he not make it good?" But Almighty God does create people in miraculous ways. He can do that. He is God. But He does not have sons or daughters as the revised and changed Bibles claim. There are no "sons of God" as in Genesis, 6:2. Adam is not the "son of God" as in Luke, 3:36. 38 Which was the son of Enos, which was the son of Seth, which was the son of Adam, which was the son of God." Almighty God is not imperfect and having human qualities and frailities. He is Unique and One and without any partners. The Quran is clear also on this issue - there is no Trinity - doesn't exist. It is our pleasure to be blessed by Allah to have so many wonderful people like yourself sending us so much mail on a daily basis. Our efforts for the sake of spreading the true message of Islam and the Muslims, take us in many directions, including a number of countries. We visit university and college campuses, prisons and jails, military installations, public and private schools and even to churches and cathedrals. 1. Only One God, the Creator and Sustainer of the entire universe. 4. Prophets of Almighty God (as prophets, messengers, servants of Allah, but never as gods or sons of Almighty God). 6. Predestination (Allah already Knows what is going to happen, but we don't. So we will only be asked about what we understood). If He creates us how then are we not sons and daughters, that seems to be the definition . I am a non trinitarian, as Jesus spoke of His fathers Kingdom, but I do believe He was the messiah and savior of man, as The Almighty God willed Him to explain what He expects of our ways. His ways are the only example of what a true life of perfection in the eyes of Allah are. So through worship of Jesus is a direct worship of the Almighty, as their will for men are as one. According to the Quran, Jesus was willed by Allah to raise people from the dead. He was the Prophet of Healing. Is there a higher power than this if our end in the hereafter is eternal life. The only thing that could potentially destroy His will would be that of the Almighty. At the same time, the Quran speaks of God as a very forgiving God as does the God that Jesus spoke of. So it is quite obvious that Allah afforded Jesus the highest of exaltation among those other than He. No link to read the story!!!!!! IT IS AMAZING WHAT U DOING KEEP UP MAY ALLAH REWARD U GOOD THINGS U GIVING US AAMIN AAMIN !!!! All praise be to Allah. i got more information about my religion (Islam) from your web sites .thank you very much my brothers and sister.i love all you for the seek of Allah.